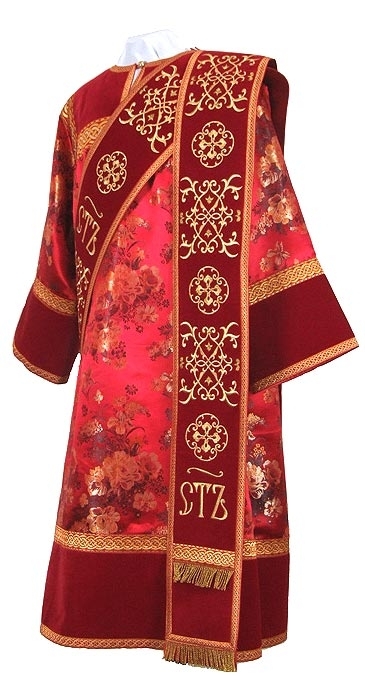 Orthodox Church liturgical Deacon clergy vestments (red-gold) by Istok Church Supplies Corp. Looking for distinguished deacon vestments? You have come to the right place! Istok Church Supplies presents a stunning array of Orthodox Christian Deacon vestments (Red-Gold) that will leave you spoilt for choice! 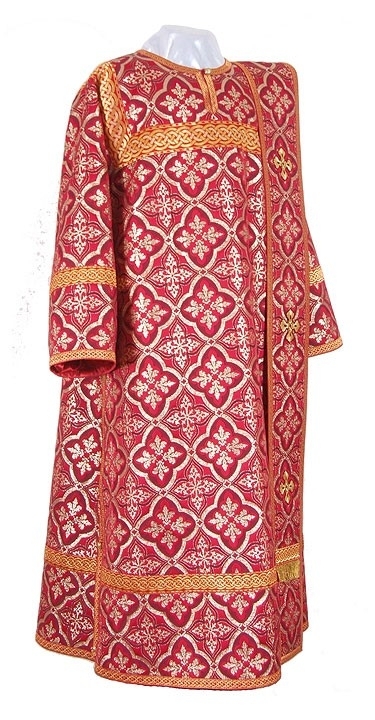 Keeping in mind the important role of an Orthodox Christian deacon in conducting liturgical services, we have curated a collection of high quality Deacon vestments (Red-Gold) made from excellent ecclesiastical fabrics such as rayon brocade, metallic brocade, Chinese rayon brocade, natural German velvet and richly embroidered material. Whether you prefer the practicality of rayon brocade, the magnificence of metallic brocade or the sheer artistry of embroidered deacon vestments, you can purchase according to your budget, church requirements and aesthetic preferences. We make sure to ensure that every aspect of a deacon’s vestment is of high quality. For embroidered vestments, we use only original German Madeira and Gunold threads. All our vestments are lined with 100% rayon material and carry natural velvet inserts. Each vestment set consists of three items – orarion, sticharion and cuffs. Customers have the option of choosing from two decoration styles – standard and premier. For standard style which is included at no extra cost, we provide ornate crosses and good quality trimmings. For premier style, we include jacquard galloon and hand-embroidered crosses. No matter which style you choose, you can be sure that the vestment will look splendid and regal. Our deacon vestments (Red-Gold) are ideal for celebrating feasts and days commemorating the Cross of Our Lord and Holy Martyrs. To enhance customer experience and ensure the perfect fit, we provide made-to-measure services. Each deacon vestment on display can be custom-made to your exact measurements that you can provide by referring to our online Measurement Chart. Our dedicated tailors in Europe will put their skills to use and create deacon vestments that fit right, hang well and feel comfortable. Our prices are unbeatable – online or offline! Feel free to browse through our extensive collection and order a vestment set that catches your eye!